Enbridge officials have been willing to talk to us about it – but only up to a point. They did invite us to come see the pipeline for ourselves out in the middle of the Straits of Mackinac. Tom Prew is a regional engineer for Enbridge and he helps the company monitor this pipeline. The company runs a remotely operated vehicle to shoot video of the pipeline every two years. 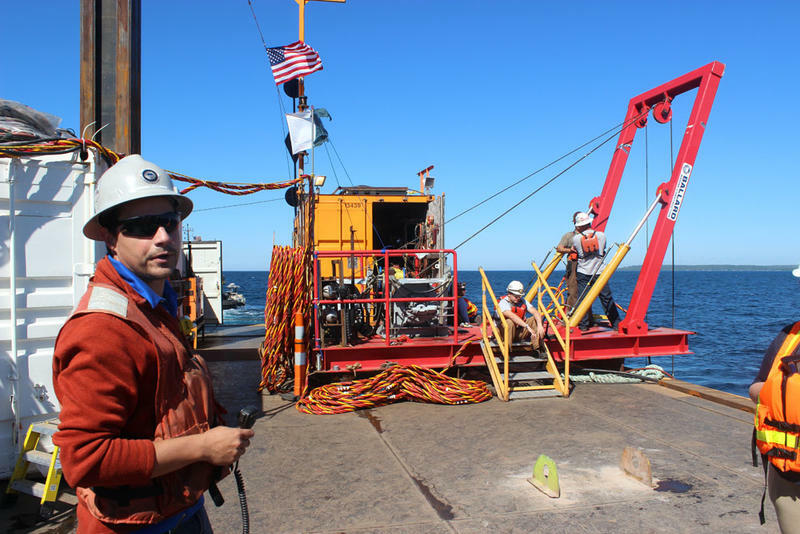 The company has also been installing new anchors on the pipeline for the last 13 years. We asked Prew what he's noticed about the 61-year-old pipeline. "It's in real good shape, is what we’re noticing. That’s the main thing,” said Prew. “I mean the coating is in very good shape. It hasn’t changed much since it’s been put in." Prew said that if they had to rebuild it, they’d probably build it the same way. 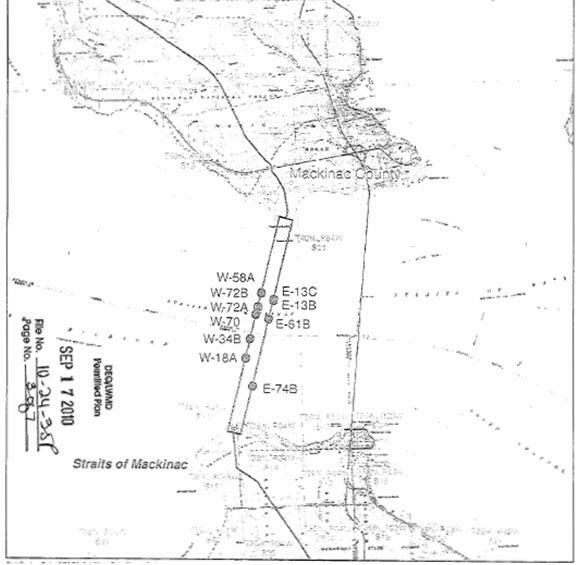 The location of the two 20-inch oil and gas pipelines crossing the Straits of Mackinac. The pipeline was built in 1953. One 30-inch pipeline is split into two 20-inch pipelines to make the crossing. The state of Michigan has an easement that laid out some specific requirements for this pipeline. You can read that easement here. 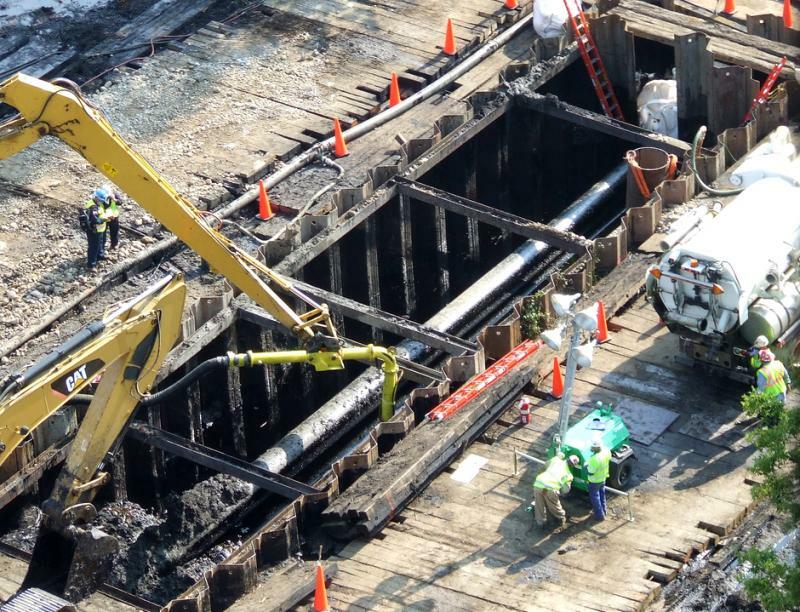 The pipelines should be buried underground until they reach a depth of 65 feet of water. The pipelines were to be tested at 1,700 psi and operated at 600 psi (Enbridge says they operate today at between 150 and 200 psi). Automatic shutoff valves on the north end of the lines, and check valves at the south end. Cathodic protection to prevent corrosion. The maximum unsupported length of pipeline should not exceed 75 feet. Enbridge says this section of pipeline does not have horizontal weld seams. Horizontal seams are where a lot of cracking can occur on other pipelines. The crack below the horizontal weld seam on Line 6B. Corrosion along a horizontal weld seam on Enbridge’s Line 6B pipeline is what lead to that pipeline cracking open. That broken pipeline spilled more than 800,000 gallons of tar sands oil into the Kalamazoo River, and it turned out that Enbridge knew about cracks and corrosion before the spill happened. As we reported earlier, the experts we talked to said how a pipeline is maintained is much more important than how old it is. 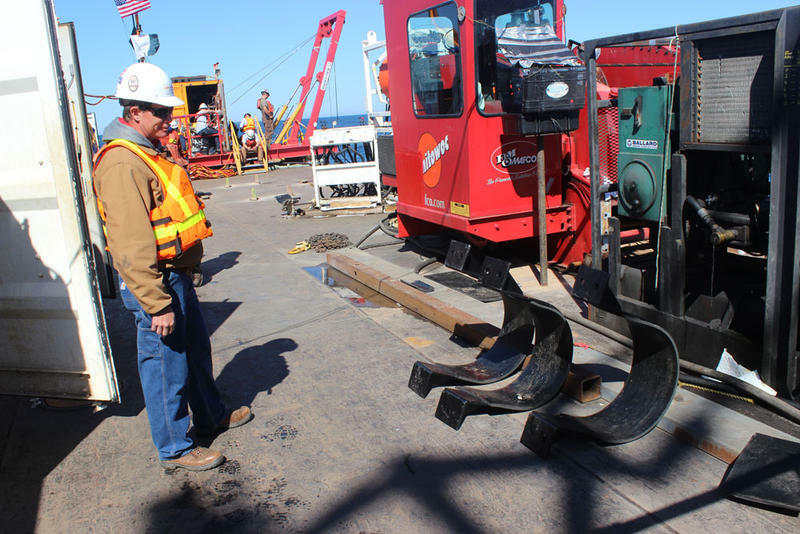 To understand the condition of its pipeline, Enbridge runs tests. They shoot video of the outside and they run tools inside the pipeline to find out how it’s doing. Rick Kuprewicz is a pipeline safety expert. He runs a consulting firm and he’s looked at the data that are available. “From what I’ve seen they’ve run the right tools, but I can’t tell you what the results are because I haven’t seen them," he said. "From what I've seen they've run the right tools, but I can't tell you what the results are..."
He says he can’t say whether the pipelines under Lake Michigan are safe or not. The specific pieces of information Kuprewicz says we should look for are the inline inspection reports. There’s a tool called a “magnetic flux leakage tool” that shows whether the pipeline has corrosion problems. Enbridge summarized what they’ve found in a lengthy report, but it doesn’t give specifics about the corrosion tool data in the Straits. They told us that the pipeline is in good condition, but when we asked them for the documents that prove the pipeline is in good shape, they said the data are difficult to interpret. "... unless you know what you're looking at, it's very difficult to read some of the data." He says they do share the data with the federal agency that regulates them. But the Pipeline Hazardous Materials Safety Administration would not talk with us for this report. They told us that we needed to file a Freedom of Information Act request for the documents. We did that, and we’re waiting for that information. But there might be other ways to see the data. Andy Buchsbaum heads up the National Wildlife Foundation’s Great Lakes office. He says PHMSA just hasn’t done a good job watching these pipeline companies. The National Wildlife Federation has been asking for more data too. They were one of many groups that pushed the state of Michigan to ask more questions. 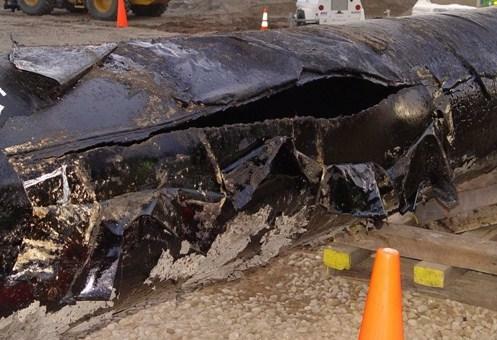 The state attorney general’s office did, and Enbridge responded. You can see the detailed questions and responses here. Enbridge mentions an attachment that shows the data we’re looking for, so we asked the state for the data that would tell us whether the pipeline has corrosion problems. But after a few days, we were told that Enbridge stopped them from sharing it. Enbridge told the state the data were protected under the Homeland Security Act of 2002. Here’s the Attorney General’s office explanation. Enbridge has asserted that the report from the Inline Inspection Tool Run you requested falls under the Homeland Security Act of 2002 and other federal statutes which Enbridge claims prohibits disclosure of information pertaining to certain critical infrastructure. We’re still reviewing their request to prohibit this disclosure but in the meantime, this document is unavailable for us to distribute. The state said they can view the data, but it’s not in a form that can be shared. They have to log into a website to see it. We asked if they’ve reviewed it and feel comfortable with what they’re seeing. They told us they’re still looking at it. 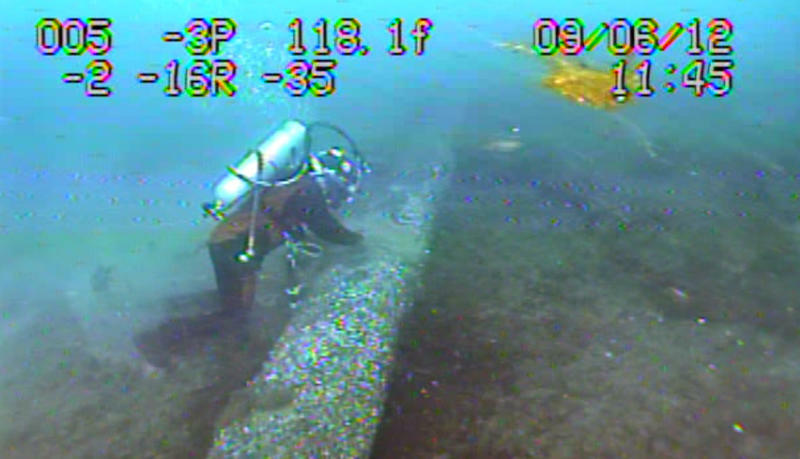 Enbridge did share inspection videos with the state — and we were able to obtain those. Two folders are labeled as “dent inspections” and they show divers taking a closer look at the pipeline. You can see another here. The company said they learned about the potential dents from their inline inspection tool. When we asked Enbridge about these videos, they said their inline tool indicated a dent of less than 2% - and results were still pending. There were two minor dents reported in the latest geometry ILI report received in July. They were less than the reporting threshold (less than 2%) but were noted in the report by our ILI vendor. We elected to conduct a visual inspection of the pipe to verify. The final report from this visual inspection has not yet been received from the inspection vendor to confirm the presence of a dent. So back to Justin’s question: What’s the status of the old Enbridge oil pipeline under the Straits of Mackinac? As one expert told us— the jury is still out. Enbridge, the National Wildlife Federation, and the state of Michigan have been meeting to talk about the condition of the pipeline, and they say they’ll continue to do so. We’re all waiting for Enbridge to share the information that will prove whether the pipeline under Lake Michigan is in good condition. *Correction- an earlier version of this story stated "The horizontal seam on Enbridge’s Line 6B pipeline is what cracked open." The pipeline broke open just below that seam. It's been clarified above.